Here's a charming swallowtail butterfly in shades of ultramarine, aqua, emerald and peridot, who wants nothing better than to shimmer and flutter about your throat. 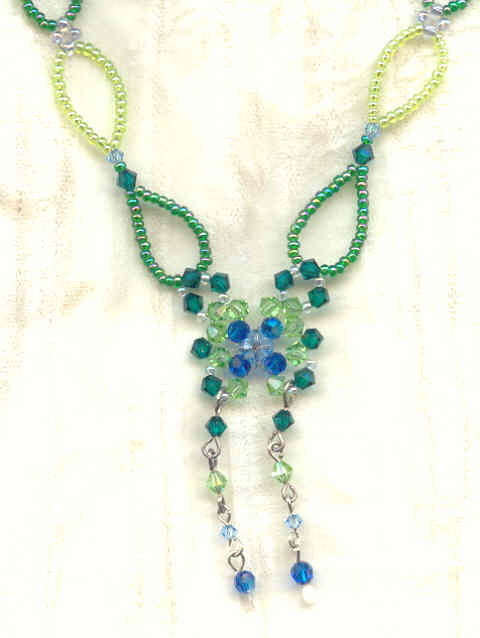 The design -- by Takako Samejima in her excellent book, 'Bead Fantasies' -- is a combination of Swarovski crystal, Japanese and Italian seed beads, and a great deal of work. The focal measures about 2-3/8" from the upper wing-tip to the bottom of the dangles. 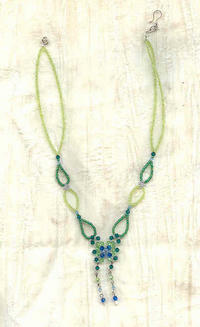 The 16-1/2" looped strand closes with a sterling silver hook set. So dainty; so feminine; so beguiling ... so obviously from SPARKLE PLENTY.